The internet provides some excellent tools for people interested in researching the archaeology which surrounds them. The National Monuments map viewer is probably the best place for any amateur (or professional!) archaeologists to start. It lists all of the recorded archaeological sites in the country on a zoomable map. The archaeological sites are shown as red dots and more information on each site can be garnered by first clicking the identify symbol (on the header toolbar) and then hovering over the relevant dot. This will provide a short description of the monument type, its RMP number and its coordinates. The map view can be changed between O.S. Mapping and aerial images to get better feel for the monument in its landscape context. This website also allows you to create distribution maps of specific monument types, an excellent tool which Charles Mount discusses in more detail here. 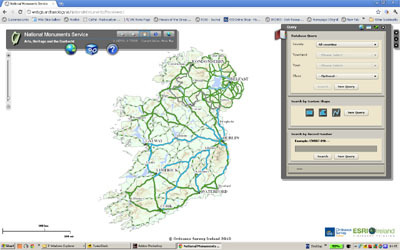 A particular favourite of mine is the Ordnance Survey of Ireland website, which provides an easily accessible map viewer. This map can be zoomed in and out as well as being searched by location. The map view can be changed between modern mapping and much earlier versions such as 1st edition O.S. Map (c. 1840). The 1st edition map is remarkably detailed and shows many archaeological sites which are no longer standing. Also by using the toolbar along the right side of the page the map view can be changed to aerial photos. These images, which were taken during flyovers in 1995, 2002 and 2005, can be zoomed in and out and are brilliant tool for viewing archaeological sites and cropmarks. Another tool for viewing aerial photos (or in this instance satellite images) is Google Earth. However, its coverage over Ireland can be patchy at times. The excavations.ie website as its name suggests has a record of all (well nearly all) the archaeological excavations carried out in Ireland up until 2007 (with the website being updated at regular intervals). It provides a short summary description of each excavation and it can be searched by year, location, monument type, licence number and keyword. A lot of recent archaeological discoveries have been found along the major road schemes and thankfully the National Roads Authority have been very proactive when it comes to publishing and disseminating this information. Their on-line webpage contains pdf copies of the impressive Seanda archaeology magazine, links to various articles and reports, as well as a large searchable database of the archaeological sites found along the roads. 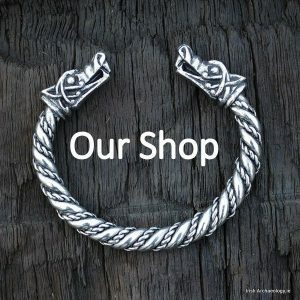 For anyone interested in early/later medieval Ireland, The Celt website is a particularly fine resource. It has transcribed thousands of documents into digital form and these can be read online. 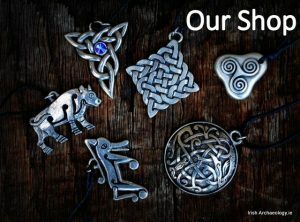 It includes most of the Irish Annals, (transcribed into English) as well as countless other texts relating to early Irish history, literature and the arts. 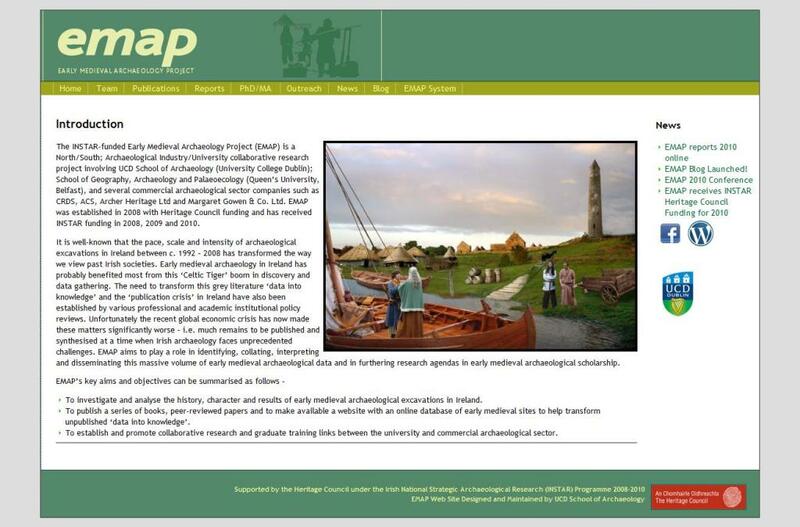 Similarly The Emap Project is an excellent source for information on early medieval archaeological sites in Ireland. It has published an extremely comprehensive report, which details and discusses a large number of early medieval excavations. Archaeological journals available online include The Proceedings of the Royal Irish Academy, which has pdf versions of recent articles. These peer reviewed papers present some of the most up to date opinions on Irish archaeology. On a slightly different note is the Eachtra Archaeological Journal, which publishes articles and reports on excavations carried out by Eachtra (a commercial company). This innovative approach to publishing archaeological ‘grey literature’ is an excellent idea and hopefully more companies follow suit. JSTOR is a very large and comprehensive database of online journals and papers, many of which are related to archaeology. However, access can be restrictive and is normally though large institutions such as universities and libraries. Archaeological blogs are also useful for keeping informed on the latest news in Irish archaeology. Some of the most up to date sites include Charles Mounts Blog, The Headland Archaeology blog, The Moore Group Blog, Seandalaoicht and of course Irisharchaeology.ie! I find the Placenames Databse http://www.logainm.ie/ very useful. Mano the placenames have scanned notes from the Placenames Section with all the recorded versions of each placename, historical records, etc. I think I found a weekend Hobby!